Most companies still have an internal approval system, where hard copy invoices are passed form one person to the other. This mostly manual process is not only extremely time consuming, but also needs a lot resources and brings a high risk of “losing” invoices in the process. Furthermore there is no transparency regarding who has and has not received invoices, and the time it takes for the invoice comes back to FA with a signature. This can result in invoices not being paid on time. By digitally approving your incoming invoices with ImageCapture Workflow, you can cut time-consuming and expensive operations out of the approval process, and you always have instant access to the status of all your invoices. ImageCapture Workflow has been specially developed to make your invoice evaluation as efficient as possible, so that you save valuable time on the approval process. The extensive workflow functionality ensures that even abnormal invoices can be handled and routed correctly within the integrated process in ImageCapture. 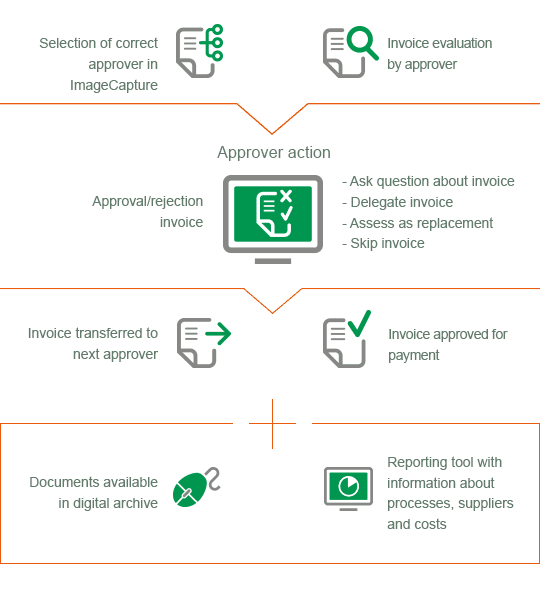 Combined with the use of the digital archive in ImageCapture, there are extensive reporting options available, so that you can access valuable management information about your invoice-processing process. You can also use ImageCapture Workflow combined with ImageCapture for Invoices and Documents for digitally distributing and archiving your other document streams, such as incoming mail items. Administrative employees or mail room personnel can easily scan paper mail, and then the documents are distributed digitally to the employee responsible for handling the content. A digital archive, allowing document retrieval directly from any desired location by specified employees.